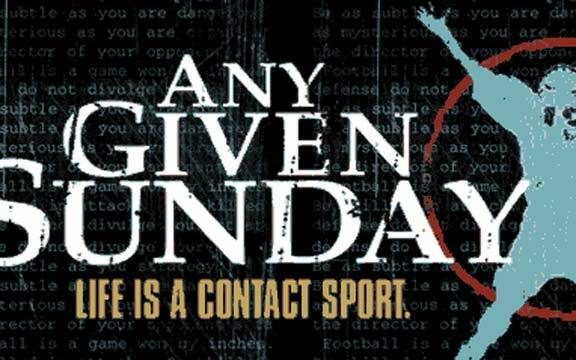 Any given Sunday, directed by Oliver Stone and with Al Pacino as the leading actor, is one of my favorite in the category sport movies. The title reminds me of a Sunday, any given Sunday, when I found myself at Qualcomm Stadium and was struck by how fanatic the American nationalism can be. The home team San Diego Chargers, which is a team in the professional league (NFL), was playing against Houston Texans, at that time a new team for the season. Neither of the teams where at any deeper level in focus for the 65.000 people who had been drawn to the scene of the action. The object of everyone’s attention was more a celebration to the American nation and the American flag. A pride of being American and Christian permeated and united the audience, regardless of team sympathy. There was a unity at the stand, without parallels in Europe. Marie Lehmann, sports journalist at Swedish television tried in a debate at SVT Forum to explain the differences between the American and European audience behavior. The in Sweden destructive supporter culture that recently has been more and more about threats, disorder and damages, was debated between among others Lars-Ake Lagrell, chairman of Swedish football association and spokesmen for the big-city-clubs, which are most exposed to these kinds of problems. Lehmann pointed out aspects that show that sports on the other side of the Atlantic are seen more as entertainment than in Europe, where the favorite team for the single supporter becomes canalization for love and hate. The debate more came to be about responsibilities than concrete solutions. The dilemma has escalated to the extent that the clubs plead to the Swedish football association to support them to larger extent than they do today. Lars-Ake Lagrell kept on passing the ball back to the clubs and their own responsibilities for single games. To lay the responsibility back at the other part when the problem is complex is a natural human behavior. The society critical TV-program Kalla Fakta showed, on the third of October 2010, how these problems become more and more complex. Fans to clubs in the highest division in football are becoming more and more aggressive and threatening against opponents, judges, clubs and even against their own players. Everything seen as betrayal against one´s owns club symbol will be punished with different methods, legal as well as illegal. When one of the supporters was interviewed and wanted to put some of the responsibility on media, the sports journalist Patrik Ekwall made fun of the person in question and dismissed him as feeble-minded. Utterances like that might be good for Ekwalls image but are hardly helpful when coming to understand or doing something about the problems. Instead it probably increases them in the long run. During the TV-program they came to the core of the problem when interviewing a doctor of philosophy at the University of Stockholm who had studied the phenomenon at a deeper level. He pointed at the fact that these individuals see their club as a religion and the club symbol as the symbol which represents it. According to the American sociologist Peter L. Berger, Europe is the only secularized region in the world, which affects in the way that sports and the belief in the own team get a very large role. As religion is about a number of socially accepted concepts of belief and rituals which focus on existents, birth, life, suffering, tragedy, injustice and death it is easier to understand the phenomena but hardly easier to do anything about. Even so, we have to keep on trying game after game, Sunday after Sunday. Posted in Theme: Sports and tagged American Fooball, Behavior, Europe, European Football, Public sphere, Religion, USA. Bookmark the permalink.